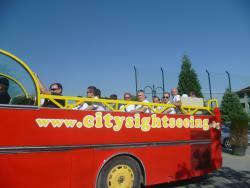 Tours from Traventuria - Day Tours tend to sell out - travelers recommend booking in advance! Wow! What a day. Our fantastic guide Martin picked us up from hotel at 7.30am and drove us to the Rila lakes where we walked with him for 4 hours. We then went on the the Monastery where Martin told us all about the history of this stunning sight. We got home at 8pm. Martin was not in a hurry to get us back to the hotel. He was discreet, professional, kind and polite. The perfect guide! Thank you Martin and thank you Traventuria. An amazing experience, well organised and full of variety, great simple hotels and food. Guide was fantastic. Thoroughly recommend to anyone who wants challenging walking and spectacular scenery on a very well managed trek. On a recent visit to Sofia, I used this Company for both airport transfers and also a full day trip to Plovdiv and Koprivshtitsa. All went like clockwork and the very friendly and knowledgeable driver/guide George made sure that all participants enjoyed the day trip. Good price and value and I would not hesitate to use again when in Bulgaria. We travelled as a private group of 6, doing various day mountain walks. We had a guide called Maya, who was very knowledgeable, accommodating and helpful. This was a very good trip plan, the standard of the food and accommodation was very good. I can recommend Traventuria for walking trips in Bulgaria. They are significantly cheaper than using the more well known UK type companies who arrange such trips. The mountains of Bulgaria are very good and on a par to other well known locations. The beer is also very cheap. 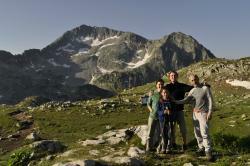 Our experience with Traventuria and our guide Kiril was fantastic. We happened to arrive at the Rila Lakes on incredibly busy day, but our guide still found us a slice of peace and serenity in the hills. Kiril knew a huge amount about the lakes and the surrounding area. 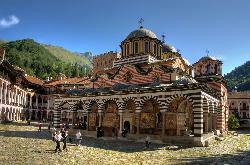 Having Kiril with us at Rila Monastery was invaluable. In addition to topics directly related to the tour, we talked at length at just about any topic that popped up, whether on the walk or in the car. 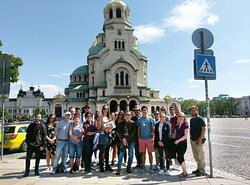 I learned much about Bulgarian culture, politics, and national character. 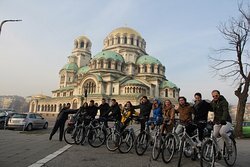 There is no doubt that these guys are excellent advocates for Sofia, Bulgaria, and the environment. 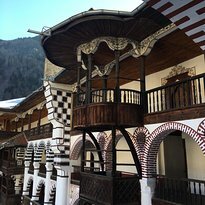 If you only have a short window, this is a good way to get to know Bulgaria better--and the perfect way to see the monastery and another worthwhile activity in the same day.